It seems like solenoid probes aren't as popular and i haven't been able to find much info on them. My main question is regarding the circuit - from what i understand an arduino board can't supply enough current to drive the solenoid, so a 12V->5V step-down board and a mosfet are required. Wouldn't it be easier to skip the step-down converter and just use a 12V solenoid hooked up directly to the PSU (as opposed to the 5V one proposed in the thread) with the same mosfet? Perhaps a 12V one would have too much holding force that it wouldn't allow the metal chuck to go upwards while probing? Please share some info on this! I agree, a 12v solenoid would make more sense - except that quite a lot of people use 24V electronics these days. 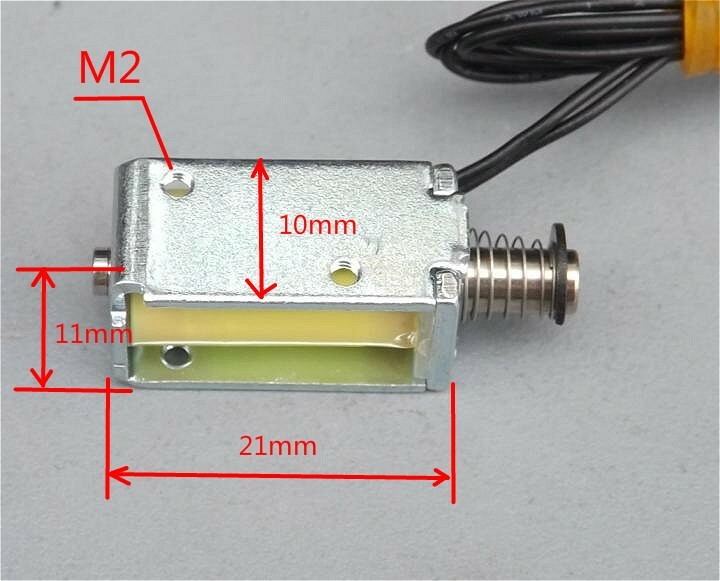 I was working on a solenoid activated probe a while ago and I got as far as finding a suitable 12V solenoid. But I abandoned it when I got the differential IR probe working well. I looked at the ROBO3D's specs and it seems to use a regular 12V supply. My guess would be that they probably couldn't find a suitable 12V solenoid on Sparkfun or Adafruit and went with that 5V one instead. I'll give these "Shindengen" 12V ones a try (pictured). They're roughly the same dimensions and about 2$ a piece. Okay, the 12V solenoids just arrived and they work pretty well! They do get slightly warm when active for longer than a minute or two, but that's probably normal. Actuation force is small, so the only option when using a mechanical microswitch would be the way it's shown in the ROBO3D forum, with a lever and set up in the normally-open position. Opto-endstops probably make much more sense here. My next question is this - since it's 12V, would it be better use a relay and BJT transistor to activate it or would a MOSFET do the job just as well?